EVERY time-worn truth about Ireland will be found on this trip: the scenery of the country's stone-walled fields and wave-dashed cliffs; the picture-postcard villages and bustling towns; the ancient ruins that have stood since before history was written. 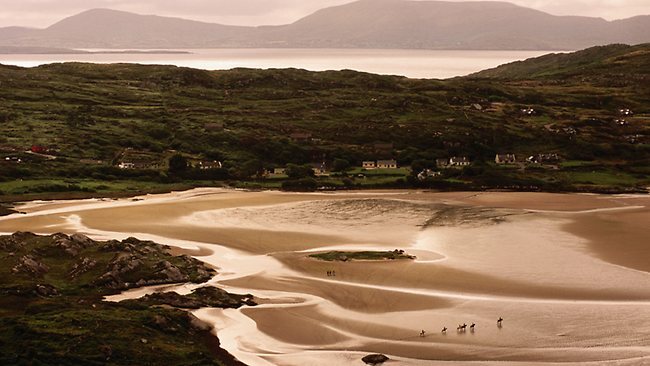 The trip begins in Ireland's storied, fascinating capital and transports you to the wild west of Galway and Connemara before taking you south to the even wilder folds of County Kerry. World-class museums, superb restaurants and the best collection of entertainment in the country there are plenty of good reasons why the capital is the ideal place to start your trip. The Drive: It's a 210km trip to Galway city across the country along the M6 motorway, which has little in terms of visual highlights beyond green fields, which get greener and a little more wild the further west you go. The best way to appreciate Galway is to amble around Eyre Square and down Shop St towards the Spanish Arch and the River Corrib, stopping off for a little liquid sustenance in one of the city's classic old pubs. The Drive: The most direct route to Roundstone is to cut through Connemara along the N59, turning left on the Clifden Rd a total of 76km. Alternatively, the 103km coastal route, via the R336 and R340, winds its way around small bays, coves and lovely seaside hamlets. Huddled on a boat-filled harbour, Roundstone (Cloch na R'n) is one of Connemara's gems. Colourful terrace houses and inviting pubs overlook the dark recess of Bertraghboy Bay home to lobster trawlers and traditional currachs with tarred canvas bottoms stretched over wicker frames. The Drive: The 22km inland route from Roundstone to Clifden is a little longer, but the road is better (especially the N59) and the brown, barren beauty of Connemara is yours to behold. The 18km coastal route along the R341 brings you through more speckled landscape; to the south you'll have glimpses of the ocean. Connemara's "capital", Clifden (An Clochan) is an appealing Victorian-era country town with an amoeba-shaped oval of streets offering evocative strolls. The Drive: It's 154km to the Cliffs of Moher; you'll have to backtrack through Galway city (take the N59) before turning south along the N67. This will take you through the unique striated landscape of the Burren, a moody, rocky and at times fearsome space accented with ancient burial chambers and medieval ruins. The entirely vertical Cliffs of Moher (Aillte an Mothair, or Ailltreacha Mothair) are one of the most popular sights in Ireland. Rising to a height of 203m, their edge falls away abruptly into the constantly churning sea. A series of heads, the dark limestone seems to march in a rigid formation that amazes, no matter how many times you look. The Drive: The 39km drive to Ennis goes inland at Lahinch (famous for its world-class golf links); it's then 24km to your destination, through flat south Clare. Dotted with stone walls and fields, it's the classic Irish landscape. As the capital of a renowned music county, Ennis (Inis) is filled with pubs featuring trad music. In fact, this is the best reason to stay here. Where's best changes often; stroll the streets pub-hopping to find what's on any given night. The Drive: It's 186km to Dingle if you go via Limerick city, but only 142km if you go via the N68 to Killimer for the ferry across the Shannon estuary to Tarbert. The views get fabulous when you're beyond Tralee on the N86, especially if you take the 456m Connor Pass. In summer, Dingle's hilly streets can be clogged with visitors, there's no way around it; in other seasons, its authentic charms are yours to savour. The Drive: It's only 17km to Slea Head along the R559. The views of the mountains to the north and the wild ocean to the south and west are a big chunk of the reason you came to Ireland. Overlooking the mouth of Dingle Bay, Mt Eagle and the Blasket Islands, Slea Head has fine beaches, good walks and superbly preserved structures from Dingle's ancient past. Dunmore Head is the westernmost point on the Irish mainland and the site of the wreckage in 1588 of two Spanish Armada ships. The Drive: The 88km to Killarney will take you through Annascaul (home to a pub once owned by Antarctic explorer Tom Crean) and Inch (whose beach is seen in Ryan's Daughter). At Castlemaine, turn south towards Miltown then take the R563 to Killarney. Beyond its proximity to lakes, waterfalls, woodland and moors dwarfed by 1000m-plus peaks, Killarney has many charms of its own as well as being the gateway to the Ring of Kerry, perhaps the outstanding highlight of a visit to Ireland. The Drive: It's 27km along the N71 to Kenmare, much of it through Killarney National Park with its magnificent views and, a further 5km on, Moll's Gap, a popular stop for photos and food. Picturesque Kenmare carries its romantic reputation more stylishly than does Killarney, and there is an elegance about its handsome central square and attractive buildings. It still gets very busy in summer, all the same. The Drive: The 47km to Caherdaniel along the southern stretch of the Ring of Kerry ducks in and out of view of Bantry Bay, with the marvellous Beara Peninsula to the south. Just before Caherdaniel, a 4km detour north takes you to the Staigue Fort, which dates from the 3rd or 4th century. The big attraction here is Derrynane National Historic Park (www.heritageireland.ie), the family home of Daniel O'Connell, the campaigner for Catholic emancipation. The Drive: Follow the N70 for about 18km and then turn left on to the R567, cutting through some of the wildest and most beautiful scenery on the peninsula, with the ragged outline of Skellig Michael never far from view. Turn left on to the R565; the whole drive is 35km long. Portmagee's single street is a rainbow of colourful houses, and is much photographed by tourists. A bridge links Portmagee to 11km-long Valentia Island (Oile aacn Dairbhre), an essential, coach-free detour from the Ring of Kerry. The trip around the island makes an ideal driving loop. From April to October, there's a frequent, quick ferry trip at one end, as well as the bridge to Portmagee on the mainland at the other end. The Drive: The 55km between Portmagee and Killorglin keep the mountains to your right (south) and the sea to your left (north). Killorglin (Cill Orglan) is a quiet enough town, but that all changes in mid-August, when the town erupts in celebration for Puck Fair, Ireland's best-known extant pagan festival. First recorded in 1603, with hazy origins, this lively festival is based around the custom of installing a billy goat (a poc, or puck), the symbol of mountainous Kerry, on a pedestal in the town, its horns festooned with ribbons. Other entertainment ranges from a horse fair and bonny baby competition to street theatre, concerts and fireworks; the pubs stay open until 3am.